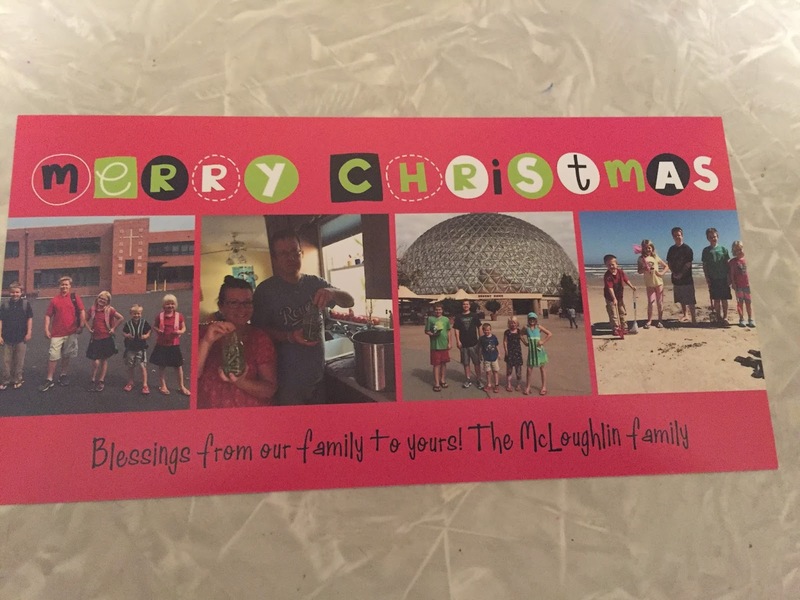 The Kerrie Show: 2015 McLoughlin Family Christmas Letter ... #Funnoying? 2015 McLoughlin Family Christmas Letter ... #Funnoying? Thought you might enjoy seeing our 2015 Christmas letter. I strive for a balance of informing and entertaining without being braggy or annoying. I'm not sure I hit it every year but it gives me a good record of what we did that year so I can pop a copy in our binder. I think I made up a new word for it: it's funnoying. It's fun and a little bit annoying at the same time. Aron built a cool new front porch on our house this year after doing some traveling to Houston and Arizona. He also worked on a side job of making cabinets from scratch for someone’s kitchen. He also grew a rockin’ garden which yielded tons of green beans, carrots, herbs and spaghetti sauce and salsa. He’s also the car fixer, dishwasher fixer, printer fixer, EVERYTHING fixer and all-around best dad ever. He needs to fish more, though. Kerrie is now homeschooling 5 kids while running her businesses (proofreading, writing ebooks and articles, Jamberry and Younique) with family dog Snoopy under her feet most of the time. She also took on the volunteer job of third grade religious education teacher, helps out at co-op and is the proud Confirmation sponsor to longtime family friend Julia. Joel is 14 and is currently the Senior Patrol Leader of his Boy Scout troop and has the rank of Life. He wants me to let you know he owns and is responsible with lots of weapons. He enjoys his co-op classes of Music Appreciation, Drama and PE and will be Confirmed in the spring. He’s getting super social with co-op friends at various activities and dances, as well as his Theology of the Body for Teens course. His belated birthday gift from us was his bearded dragon Oliver. Michael is 12 and always entertains us with his deadpan humor and brilliant jokes! He’s taking PE, Science and LEGO Robotics in co-op and is making new friends. He takes care of Jiggy the tortoise, who he has had for about 4 years now. He discovered a book series he enjoyed, devoured all 9, and is back on his book-reading strike. Callie is 10 and gave volleyball a shot this past fall and did really well with it. She is still the fashion queen of our house, sings well and is hoping for a sewing machine for Christmas. She loves her PE, Science and LEGO Robotics classes at co-op. She is helpful around the house and is an entrepreneur, with her own little at-home massage business (Mommy gives her 99% of her business). Eva is 8 and loves her Catechesis, Science, Storytime and PE classes at co-op with her friends and also enjoys lunch and recess. She likes to play My Little Pony, Shopkins and Barbies with her best friend, who is also named Eva. She is a happy girl who is part homebody (happy to sit around coloring) and part lover of on-the-go fun. Samuel is 6 and is in the same classes as Eva at co-op and says he is having a good time there. He enjoys all types of sports and shooting Nerf guns and taking Joel’s Airsoft Gun Training Classes in our basement. Sam made money this past summer selling cupcakes Mommy just made for his birthday, lemonade and sand from the sandbox on the street corner in front of our house. Springtime found us in Houston, Texas and Galveston Island while Aron traveled there for work and let us tag along. In October we got to go to Eugene T. Mahoney State Park for a week that included nature hikes, Omaha Zoo, Children’s Museum and more. The rest of the year we swam, went strawberry picking, spent time with our wonderful neighbors and other friends and family, saw the Royals Celebration Rally (oh, what a day! ), and just had a blast with life in general, appreciating every day! As always, you can check out more of the family fun at TheKerrieShow.com. Have a fabulous 2016!